After making a few changes, including building my own teardrop trailer, I've finally found the right travel rig for me. Follow the link below to find out what I'm doing now. This project has been a fun one and definitely tested my skills and patience from time to time. The trailer tows great behind my truck and hasn't really affected my gas mileage too much. After a week and a half camping in the desert, it performed admirably and will be a great weekender for someone that likes to tent camp without the hassle of setting up the tent after each move. Building it to my specifications was both a creative and thought-provoking endeavor. Now the negatives. First, the trailer is a stretch as a full-time RV as there isn't enough room to move around when the weather outside isn't cooperating. After a 48 hr. Santa Ana wind blew through, my dog and I were ready to abandon ship. Second, as a writer, I need a dedicated table at which to use my laptop and there just isn't room to accommodate this. If you need something to tow behind a car as you spend a week camping on occasion, this would be fine, but if you need something more, as I do, save your money and step up to a travel trailer or motorhome. I now live and travel in a 19' Skyline Nomad and while still a little small at times, it weighs in at under 3000 lbs. and tows perfectly behind my V6 truck. I had to return home to San Diego for a few weeks so, I was able to finish the interior work with the exception of the front cabinet that I'll install later. Here are a few photos of the finished interior. As you can see, I've added vinyl flooring, baseboard, wall and ceiling seam trim, cove moulding up high, and a proper battery box. It's been quite a while since my last post. I've been working slowly on the trailer as money has allowed. The first project was building a bed that could be opened up to store supplies. I took photos of the construction, but I can't put my hands on them. I'll revise this post if I find them later. I changed my mind on the electrical pigtail that I used to get across the country and properly wired the trailer for both 120v house current and 12v accessories. This took quite a while to complete but really works very well. I've been living in the trailer as I'm working in it, and for anyone that's ever done remodeling in their bedroom while sleeping there knows what I've been going thru. Lots of moving things in and out of the trailer and cleanup is the last task of every day. I'm almost done installing 1" insulation foam on the walls and ceiling. Over this I'm hanging 1/4" birch plywood and screwing them down with 3/4" Lathe screws. Here are a few recent photos. I've wired the trailer for three overhead lights and one exterior light by the door. After installing all the lights, I switched out the normal bulbs included with the lights for L.E.D. light bulbs that use 1/10th the power and last over 100,000 hrs. They are very blue in cast however, and I'm still considering whether or not to keep using them. They do use almost no energy to run and my battery still registers as 100% full after 5 hrs use per night for over a week. At 1/2 amp per hour, the battery could last almost two months. That would be great since I plan to leave San Diego for the California desert on the 28th of this month (Sept. 2011) and a good deal of my camping will be dry camping (Camping without services like shore power). I won't be able to buy and install flooring before leaving for the winter, so I'll finish what's left to do on the trailer in the spring. I did invest in a 1000 watt inverter to power my laptop during the day to allow me to continue working on my first novel. The inverter will run off the truck battery while the engine idles. This will also allow me to run my 120v fridge while the truck is running, keeping my lunch meat and condiments cool. Well, after several months of waiting, dozens of emails between myself and the trailer manufacturer to get modifications right, the big day finally arrived. I left Ft. Lauderdale at 4:30am for the 7.5 hr. drive to Willacoochie, Georgia where my trailer would hopefully be waiting. When I arrived, there were a couple of things to work out. First, the rims that were on the trailer tires were not the ones I ordered. Second, the handle to be mounted on the side of the entry door was M.I.A. Brent, obviously the production supervisor, said that it would be done quickly. He was right. In an hour, I was back on the road for another three hour drive to Anastasia State Park near St. Augustine, Florida and my first night in the trailer. Here are some pics of the trailer. Click on the images to enlarge. I realized that by picking up my trailer on June 20th, It'll be pretty hot returning to San Diego, CA along Interstate 10. So I looked at temporary ways to bring electricity into my trailer to run my fan and small fridge. I'll be staying in RV parks so the issue will be how to get an electrical cord into my trailer so that I don't have to leave a door cracked open. The quickest and easiest method used by a lot of cargo conversions is to simply punch a hole in the floor and pass the cord through. But that got me thinking. If I was going to drill a hole in the floor, maybe I should look at a simple but more permanent solution. It would also allow me to use my 30amp 125v RV power cord. The photo below shows my solution. I bought the yellow "pig-tail" at Amazon.com. It's 30 amp and about a foot long. It will enter thru a small hole that I will cut in the floor with a 7/8" hole saw and will be reattached to this box I built with parts from Lowes. The box will be screwed to the wall. Pretty straight forward. The black 30 amp RV cord will attach to the pigtail under the trailer and hook up to the park's power box. The little yellow device in the upper right is a polarity tester. I'll use it to test first the park's box, then 30 amp cord and finally the outlets in my box. Clean and simple install. Best of all, the whole setup costs less than $20.00, not counting the 25 ft. power cord. I have the hole saw and a cordless drill ready and will complete the installation on day one of my trip. ** Disclaimer: Please seek the advice of a qualified electrician before wiring your trailer or have them do it for you. Electricity can kill you. After a lot of research and study, I've decided to buy the motorcycle trailer (the red one pictured below). It costs a bit more but offers more in the way of included options, better construction, and better towing due to less windage. It is also closer to me, thus saving me $250.00 in gas. 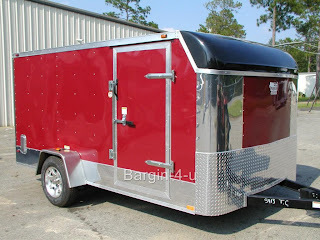 After a few weeks of shopping for a trailer, I've narrowed it down to two manufacturers. The first, builds a standard cargo style trailer and is happy to make a few modifications for me if I need them to. The second manufacturer builds a motorcycle trailer that is lower to the ground due to a 4" drop axle and reduced inside height. It would be 5'-6" instead of 6'. Both of these changes make the motorcycle trailer cheaper to tow due to less wind drag. This builder is also happy to work with me on changes to make my trailer more livable. I was prepared to install my own windows after bringing my trailer home, however, both manufacturers offer 15"x30" windows installed for around $140.00 each. That includes the labor of cutting and reinforcing the area around the windows. Obviously, it's easier and cleaner to frame these out during the framing stage before walls are installed. An offer too good to refuse. Another modification I want to make concerns the side entry door. 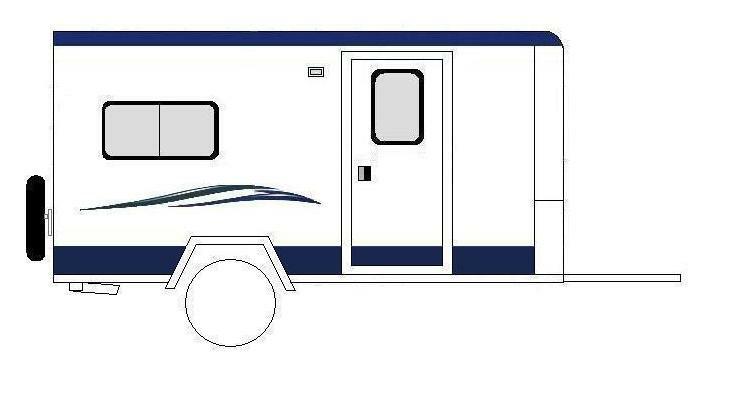 Both manufacturers offer a true RV door with screen and window for $500-$600 but this add on would brake my budget so I'm planning to delete the usual "cam lock" and have an RV Flush Lock installed for $55.00. To this, I'll add a dead bolt lock when I get the trailer home. This will give me the look of an RV door without the hefty price tag. Another option that I find hard to resist is a Screwless Exterior. It'll add another $200.00 to the final price but will really add value and curb appeal. It would be hard to pass this up. The only other add-on I'm considering is a matching spare tire and wheel. At $140.00, it's another budget breaker but an important option to be sure. 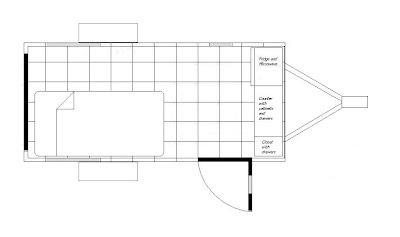 This is my proposed layout. Definitely subject to change, but it's a good starting point. The grey areas along the sides of the trailer and in the door are windows. (2) 30"x15" in the rear of the trailer and smaller vertical windows in the door and front driver's side. The cabinet in the front is 18" deep and counter height except for the nearly roof high closet on the passenger side﻿ closest to the side door. Scale: 1 cube=12"x12" * Click on image to enlarge. 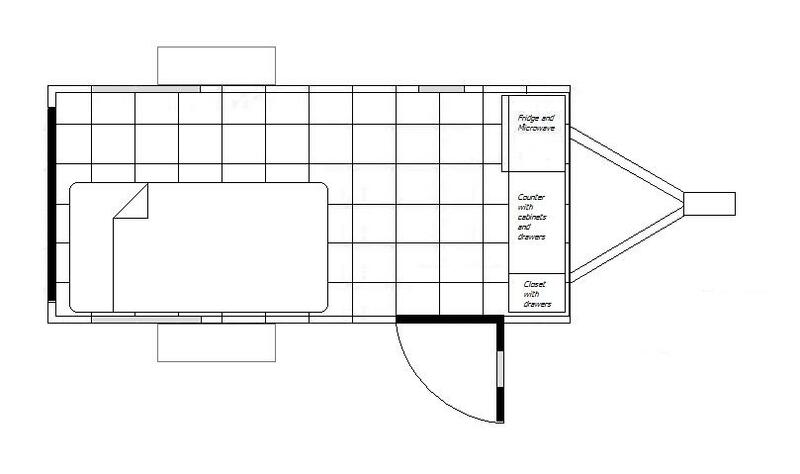 While looking for a builder for my 6'x12' cargo trailer, I took a few minutes to sketch out what I have envisioned. The first step in this process is to determine the perfect size for my mobile mansion. Too large and I'll consume additional fuel towing the trailer and additional heating fuel heating the trailer. Too small and lack of space issues arise. So, I decided to reverse engineer the dimensions of my future trailer based on what I want to put into it. I'm 6' 2" tall and plan to install a twin size (approx) bed. This bed needs to fold up against the wall so that a motorcycle can be loaded in and secured. This will also aid in using the cargo trailer for non-camping purposes. Plastic storage boxes under the bed can be used for additional bedding, etc. I know that I want a cabinet in the front to hold a small microwave and refrigerator. The cabinet will also hold all cooking supplies and dry goods. Next to that, I want a closet to hang clothes in. I don't need much space. Just a tall section for shirts and pants and a few drawers for the rest. This brings up an important question. Am I alright with built-in cabinets or are removable cabinets the way to go? After considering this subject for a while, I've come to the conclusion that being able to remove the front cabinet with the microwave and refrigerator for interior space is important to me. The only truly built-in component will be the fold-up bed (sticking out less than 6 inches from the wall). So it's settled then. I'll start my search for a 6'x12' cargo trailer. I've always loved to camp, but as I get older, the idea of sleeping on the ground in a tent with all that comes with it, doesn't appeal to me. I still want to get out and see America and stay in its beautiful campgrounds, so, what are my options? Motorhome, travel trailer, pop-up trailer, camper shell for my pickup? Let's look at those options as I see them. A motorhome is a great way to see the country and has all the comforts of home. In fact, some folks live full-time in motorhomes crisscrossing the country. As great as that sounds to me, I don't require that much room and certainly don't need the brutal gas expense. And then you have repairs. I'm a "keep it simple" kind of guy and need to be able to make my own repairs when needed. A Travel Trailer certainly fits the bill from a comfort standpoint, but again, the weight of the trailer requires a truck with an engine larger than mine (V6,4.3L) and again a sizable gasoline budget. If it costs too much, I won't go. 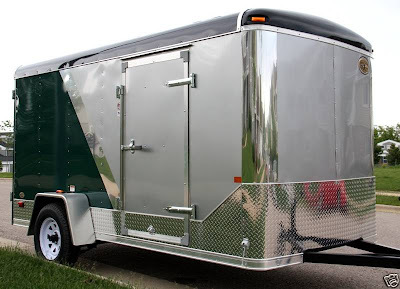 Pop-Up Trailers have always been popular and with the price of gasoline at current levels and forecast to rise, Pop-Ups are a very popular choice. They are fairly light in weight and because of the low profile when closed, are a dream to tow. So why not get one? For me, the screen/canvas walls give no real security. I know it's not a very rational reason. Campgrounds are traditionally one of the safest places to be and most campers are there to enjoy life closer to nature. Still, it's something that bothers me so I say "It's not you", Pop-Up trailers, "It's me". A Camper Shell was another option. The economy was certainly there. Very little difference in gas mileage with the camper installed. The space issue, on the other hand was indeed a concern. I am, by nature, a minimalist, but a trip of several months requires a lot of supplies and those supplies take up a lot of room leaving no room for me to sleep. Kind of the "this bed's too small" scenario. So what's left? How do I get the space I need without the weight and gas budget that I don't want? The answer for me was a Cargo Trailer Conversion. I love the idea of being able to customize it any way I want to and the size and weight will be a breeze behind my 2007 Chevy Silverado. 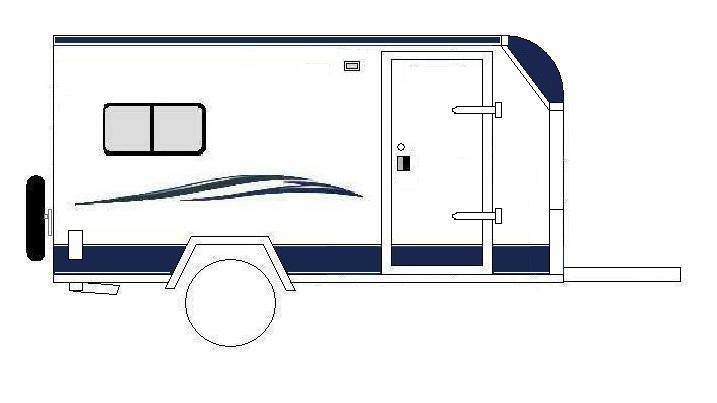 This blog will follow the purchase and customization of my 2011 Cargo Camper. Stay tuned.